Martin O'Neill has told his Republic of Ireland hopefuls they have two games to force their way into his Euro squad. The Republic face Switzerland and Slovakia in home friendlies over Easter with places still up for grabs ahead of the Euro 2016 finals in France. Manager O'Neill said that with only one more friendly to play against Holland in May, time is running out for some of the fringe players to impress. "I want to see a couple of the lads, the Euros are just around the corner." O'Neill's side play Switzerland at the Aviva Stadium on Friday followed by Slovakia at home on Tuesday 29 March. 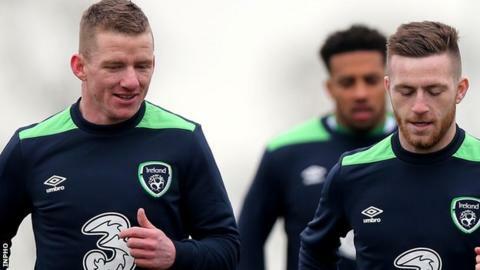 Although another friendly could be squeezed into the schedule, the Holland friendly on 27 May could be the last opportunity for latecomers to make a late charge into the squad, as winger James McClean did four years ago. "There's a possibility of trying to organise another match but really after these two games, it's finalising a certain number of players and hoping they come through unscathed in the next couple of months," stated O'Neill. "You are talking about very little break-time after that." Wolves defender Matt Doherty, Bournemouth and former Coleraine midfielder Eunan O'Kane, Birmingham's Stephen Gleeson, Brentford midfielder Alan Judge and Aberdeen's Jonathan Hayes are among those hoping for a taste of the action. While for some, that will simply amount to training with the senior squad at Abbotstown, O'Neill is adamant that there are some places which are yet to be nailed down. He said: "There are one or two players there who have shown their worth in the qualification games and barring injury, there's a really great chance of them going, obviously. "But there are other places up for grabs."